Harsh Trivedi, MD, MBA, serves as President and Chief Executive Officer at Sheppard Pratt Health System. On April 3rd, Dr. Trivedi will speak at Becker's Hospital Review 10th Annual Meeting. As part of an ongoing series, Becker's is talking to healthcare leaders who plan to speak at the conference, which will take place April 1-4, 2019 in Chicago. To learn more about the conference and Dr. Trivedi's session, click here. Question: What’s one strategic initiative that will demand most of your time and energy in 2019? Harsh Trivedi: As our health system grows, it is imperative that all of our care teams across our 350 sites of service recognize that they are part of one team, working together, to deliver a singular mission: to provide the care that we would expect for our loved ones. We will transform health care by bringing together the skillsets of thousands of employees and the strengths of a coordinated continuum of services when we work as one—to deliver the best care, to deliver reliable outcomes, and to provide one care experience across our health system. At Sheppard Pratt, we offer more than 160 unique programs across 16 Maryland counties. From acute care programs to those embedded deeply within communities, our programs move the needle for social determinants of health and strengthen communities in the process. The key to delivering on our mission daily relies on integrating our health system and empowering our employees at the point of care. We need to encourage their passion to deliver better care and nurture their solutions to improve care processes. Fueled by the innovation of those closest to care delivery and by partnering with patients and families to find new solutions, we can help people live healthier and more fulfilling lives. Q: What do innovators/entrepreneurs from outside health care need to better understand about hospital and health system leaders? HT: I am thankful for the American Hospital Association’s purposeful work to redefine the ‘H’. It is important for people outside of health care to understand the role hospitals and health systems play as the bedrock of many communities across the nation. Health care leaders are invested in their local communities to deliver the programs and services that help people thrive. At the end of every new innovation or new service offering, health system leaders are focused on finding solutions for real people facing enormous health challenges. Health care is also a complex and heavily regulated environment. Simply having scale and technological prowess is insufficient to fix health care. Collaboration with business and civic leaders as well as government and health care organizations are critical to ensure that we focus on solutions that are financially viable and have meaningful population impact. There is a moral and social responsibility to deliver better care and find solutions for the people we are serving. A solution that only focuses on fiscal viability at the expense of overall health needs, won’t achieve better outcomes nor have a lasting impact on individuals, their families, and our communities. Q: Can you share some praise with us about people you work with? What does greatness look like when it comes to your team? HT: I am reminded of a quote by Coach John Wooden in his book, Wooden on Leadership, that says “The star of every successful team is the team.” He shares that through team spirit, individuals who are “doing their jobs correctly” can be transformed into an organization where members are committed to working at the highest levels for the good of the group. I am fortunate to lead a mission-minded organization with people who fundamentally understand why we exist and how vital our services are for those we serve. For me, greatness is defined at the leadership level by people who model servant leadership, provide compassionate care, and inspire transformational change throughout the organization with a shared vision in mind. Our frontline employees are empowered to find better solutions for the work they do every day. They understand new ideas are encouraged, and within our culture of safety, failure is seen as a necessary step to implement new solutions that lead to desired outcomes. 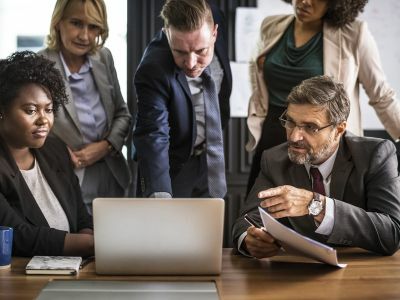 While we function as one team, the team is not defined by who is in the C-suite or who has managerial titles, but is indeed every employee in the organization.